With the AmeriGlide Platinum Curved Reconditioned Stair Lift, you can get the tool you need to safely travel the stairs of your home without breaking the bank. This incredible value offers a new track that is custom designed to overcome design challenges like 180 degree turns, multiple landings, and even spiral staircases. It also comes with a used carriage that has been through an extensive cleaning and repair process so that you can save money without sacrificing quality or performance. The AmeriGlide Platinum offers a unique combination of safety and comfort. Not only does the swivel seat allow for easy dismounts, it is ergonomically designed to cushion and support every user. In addition, it comes standard with 12 safety sensors that will detect obstructions and a safety belt that will keep passengers securely in place. 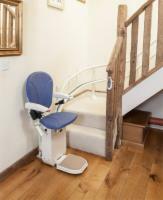 Call us today to learn more about this superior stair lift and how you can increase your mobility for less.